An ideal machine to bundle aluminium profiles prior to loading to lorries or putting them into crates / boxes. 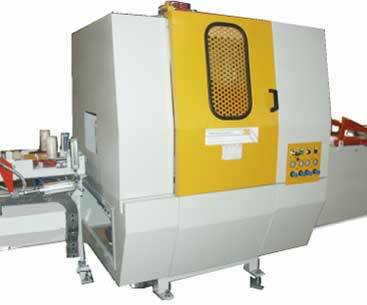 The machine uses two crepe paper or nylon/plastic band rolls simultaneously. Machine designed with a compact steel frame. Replacement of wrapping material is carried out quickly and easily (under one minute) using bayonet type quick change holders for rolls of wrapping materials. Profiles are drawn through the machine by a series of rollers which open and close automatically, allowing bundles with different dimensions to pass through automatically without stopping the machine. 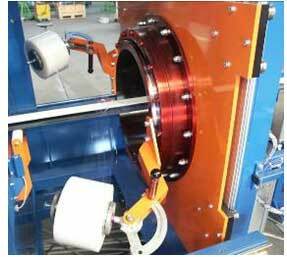 The wrapping device is composed of a rotor which rotates and holds the roll of wrapping film which is supported by a mandrel with specially designed clutch designed to maintain the tension constant until the roll is finished; these rolls are easily and quickly replaced in less than one minute. The speed is regulated by means of an electronic inverter controlled through a potentiometer situated on the main control panel. An automatic device senses when the roll has run out or should the wrapping material tear, bringing the machine to a complete stop and warning the operator. Machine designed to operate in “stop and go” mode with a blade cutting the wrapping material automatically at the end of each wrapping cycle. Max. speed 40 m. per minute in “continuous” mode (standard machine).